Posted on Wed, Jan 11, 2012 : 6 a.m.
Winter Stonefly Search volunteer and Van Buren Township Supervisor Paul White ignores the cold while netting stonefly nymphs in a previous year's search. The search is sponsored by Huron River Watershed Council and is a critical element in the organization’s continuing assessment of the health of the river and its tributaries. For a fly angler, finding the underside of a mid-stream rock teeming with aquatic insects is a thrilling moment: Those insects — often stonefly nymphs — indicate the stream is healthy and likely supporting trout or other game fish. It also provides a glimpse into a fascinating life cycle that anglers and fly tiers spend hours trying to imitate in appearance, size and presentation. As part of a long-term study of stream health, the Huron River Watershed Council is offering you the opportunity to help assess stream health by finding and counting winter stonefly nymphs at its annual Winter Stonefly Search, Saturday, Jan. 28, 2012. To conduct the search, the HRWC relies on up to 150 volunteers who form about 30 teams that canvass winter stonefly populations at locations along the Huron River and its tributaries. Because stoneflies are especially sensitive to pollutants and require sufficient dissolved oxygen in the water to prosper, they are a "gold standard" as an indicator of stream health, said David Wilson, an HRWC volunteer who will be attending his fifth search this year. But wait. Did you say . . .
You now may be putting a few things together: Michigan, January, aquatic life, looking under rocks mid stream. This sounds cold. But, David and HRWC Ecologist Paul Steen stressed that it's primarily fun, educational and . . .
"...a character-building experience," David said. "It does require a positive attitude. 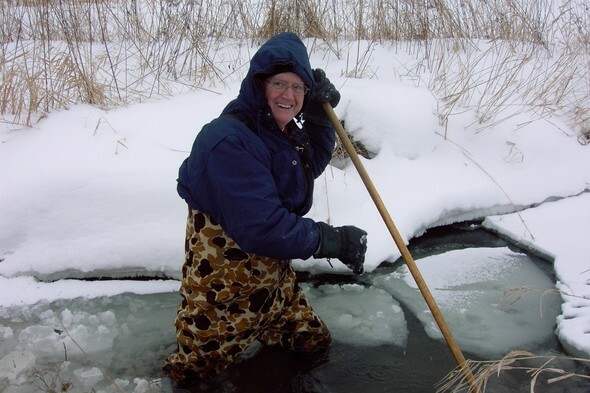 If you love the outdoors and you care about stream health, it’s great fun." Paul noted that trained collectors and team leaders are the only ones who enter the water. Clad in warm clothes and waders, the collectors scoop up materials from the stream bottom and hand it off to the other volunteers for sorting and counting. Paul and David emphasized that new volunteers don't wade into streams. "In just a couple of months, they will emerge as adult flies," Paul said. "But January gives us a chance to see them in the nymph stage, before they leave the stream and are more difficult to find and count." There are other reasons to conduct a stonefly nymph search in the winter months. When the water is cold, many game fish are in dormancy and not voraciously seeking stonefly nymphs for food. Also, cold temperatures slow some decay processes in the stream — that leads to higher levels of dissolved oxygen. Paul said that the multi-year study has turned up the occasional surprise, as it did last year when one team found no stonefly nymphs at one of the regular sites that had produced stoneflies in previous searches. He said that there could have been many reasons that the stoneflies were gone — poor oxygen, farm run off — and that after HRWC confirmed the results, it notified the Washtenaw County Water Resources Commissioner of a potential problem. David, whose background is in chemistry and environmental engineering, praised the HRWC's work to monitor the health of the Huron River. "If you want to know the health of a stream, don't ask a chemist, ask an aquatic biologist," he said. "They get a complete picture of a stream's health by looking at what's alive in the stream and what may be missing." You can volunteer to be part of this important study by visiting the HRWC website. Volunteer registration closes Friday, Jan. 20. If you enjoy the experience, you can attend additional sessions at HRWC about identifying aquatic insects or even take additional training to become one of the team members who wades into icy streams. A stonefly nymph. Fly anglers and fly tiers spend hours trying to imitate the stonefly in appearance, size and presentation. After five years, David confessed to still having a fascination with the search, using a crowbar to break through ice, entering water so cold that it would quickly send an unprepared person into hypothermic shock. He cited Wilson's First Rule of Winter Stonefly Searches: "The one who breaks through the ice is always the one not wearing waders." When asked what advice they would give to new volunteers, both Paul and David quickly said, "Dress warmly!" David added, that volunteers should "bring along a lot more warm clothing than they think they’ll need. That should be just about right." According to a press release about the Stonefly Search, "HRWC is a nonprofit coalition of local communities, businesses, and residents established in 1965 to protect the Huron River and its tributary streams, lakes, wetlands, and groundwater." The HRWC website,has additional information about the organization. Adult stoneflies deposit eggs on or over a stream or lake. Those eggs scatter and sink before they hatch in a few days or weeks. The stonefly hatchlings — called nymphs — then find a suitable home, frequently under rocks as their name implies. They remain nymphs for one to three years and then emerge as adults and start the process over again. The stonefly's Latin name, Plecoptera, translates to "folded wing" and describes their adult stage, but stoneflies are important trout food from the time the nymph nears a half-inch in length. For more detail on stoneflies and other flies, I strongly recommend Dave Whitlock’s book, "Guide to Aquatic Trout Foods." Faithful readers of this column should take note that Dave Whitlock uses the more dignified — but less poetic — term “Group 4" to describe the class of aquatic life that I referred to as "Wiggly Things" in a previous post. Send me an email if you are tying unique flies, involved in activities related to local fly fishing, or even have a great Michigan fly fishing story to share. Tom Teague is a local consultant, writer and fly angler posting every other Wednesday — more often if there’s news to share — in the Lifestyles section of annarbor.com. You may email him at tom@tomteague.com. Thu, Jan 12, 2012 : 4:44 p.m.
@Rork - I've seen some astonished looks when kids or new anglers net some gravel or turn over a rock and discover how much non-fish life exists in a river. Alas, those warm December days were also very busy work days for me, but -- looking at fishing reports -- it appears that a lot of people were enjoying some great steelheading. I hope you got out on the water at least once. Thanks for your comment and thank you for reading. Thu, Jan 12, 2012 : 3:59 p.m. Yet another nice article. I sometimes bring a small net to sample what is living in the river, cause I want to know, but also to show kids that there's allot going on in there that you might not suspect. Hope those of you with time had some great steelheading on those warm sunny days - they seemed perfect.